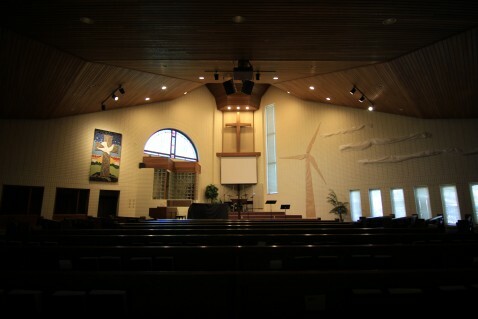 Our 10:00 am service contains singing, Scripture readings, prayer, a sermon, among other creative worship expressions. Our services feature sermons that seek to be grounded in Scripture, relevant to our context in the world, engaging, and accessible by everyone, no matter your age, gender, ethnicity, etc. The Exchange: Preschool – Parents are invited to drop off their children ages 2-5 for supervised playtime in the nursery behind the sanctuary. The Exchange: Kids – Grades 1-5 are invited to meet downstairs for games, Bible stories, and lots of other exciting things! The Exchange: Youth – Grades 6-12 are invited to come and hang out downstairs for games, Bible study, and more! The Exchange: Coffee House – All ages are invited to come and grab a coffee or espresso from the Coffee House located near the front entrance and to take advantage of one of our many comfy alcoves throughout the church to enjoy conversation with one another. If you prefer to have a semi-directed conversation regarding the morning’s sermon, there are tables set up in the gym with questions provided. So grab your coffee, and make your way to whichever location you prefer! What are the expectations for when I visit? If you are visiting with us, there are no expectations, simply an invitation. You are free to engage on whatever level you are comfortable with. There is also no expectation to contribute to the financial offering during the service as we are just glad that you are here with us! As a practical expression of “Come As We Are,” the first part of our Vision at McIvor Church, there is no dress code, so we encourage you to wear whatever you feel most comfortable in. For some, this means wearing a suit and tie, and for others, this means jeans and a t-shirt. At McIvor Church, you will find a broad variety of musical styles in our gatherings. We place a strong emphasis on contemporary music in the rock/pop style while at the same time honoring our rich history of hymnody.